Improve the workflow at your Torrance businesses with the help of Advanced Office. We specialize in helping you find the right office equipment for your needs and budget as well as uncover opportunities that may not be readily obvious to you. 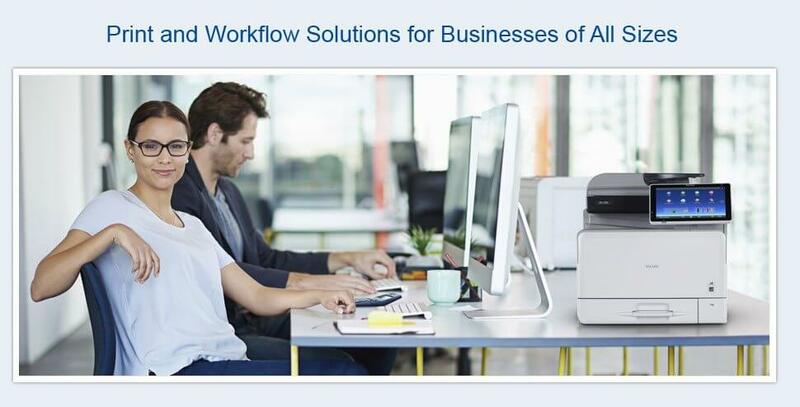 Our workflow solutions improve productivity, facilitate document management, and cut print-related costs. To get you started, one of our copier and printer professionals will visit your Torrance office and evaluate your office's layout and square footage, monthly print volume and related expenses, existing copiers and printers, workforce, and how paper moves through your office. Taking into consideration any expressed requirements and budget constraints, we'll come up with a comprehensive plan that is completely tailored to your business's printer and copier needs. This plan includes our recommendations for products, service and maintenance, software, training, and financing. Advanced Office has been serving Torrance businesses since 1977. 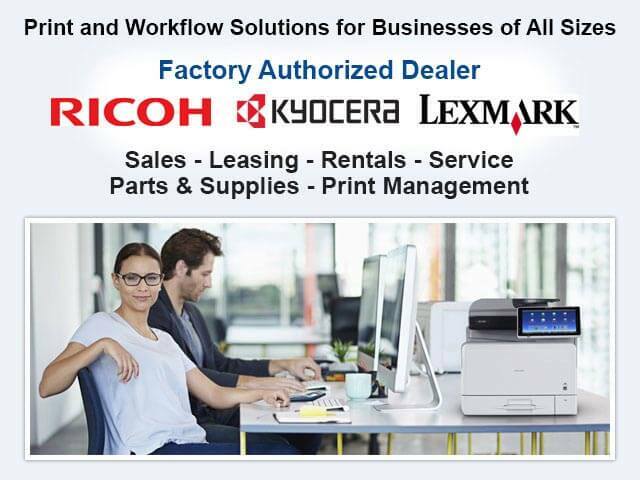 We're independent authorized dealers for Ricoh and Lexmark, and experts in print and workflow solutions. Everyone on our team, from our sales consultants to our service technicians, receives extensive manufacturer training and is extremely committed to offering exceptional customer service. Helping us provide our superior level of customer care is the impressive level of industry experience we have on our team: our service technicians average over 12 years of experience and our sales consultants average over 15 years. Over the last 30 years, we have provided stellar copier and printer sales, leasing, rentals, installation, and service to tens of thousands of Southern California businesses and earned a spot among Ricoh and Lexmark's most successful and highly regarded dealers on the West Coast. Ricoh and Lexmark offer a broad selection of digital office equipment to meet the needs of virtually any business in Torrance -- no matter its size or industry. Their selection includes copiers, printers, production printers, wide-format printers, digital duplicators, and fax machines. To keep these high-performance machines running optimally, Advanced Office offers all-inclusive service and supply agreements as well as parts and labor agreements. These service and maintenance contracts make it easier for your Torrance business to better manage print-related costs and give you access to the area's best printer and copier repair and maintenance services. Our factory-certified and fully insured service techs average a four-hour response time and excel in first-call effectiveness, which means that we are extremely successful in fixing printer and copier problems on the first visit. Our techs keep their vehicles fully stocked with the most commonly used parts at all times and have access to our local warehouse where we have over $1 million in parts readily available. Plus, when our Torrance clients call, they'll reach our local dispatch where live customer service representatives are well-prepared to respond to their needs. Advanced Office prides itself on having fast internal communication without the bureaucracy and red tape common in large national printer and copier service companies. We have extremely high standards for our quality of service and are there for our Torrance customers when they need us. Call Advanced Office today to learn why we offer Southern California's best value in copier and printer sales, leasing, rentals and service. We offer competitive pricing, 100% financing, and low leasing rates. 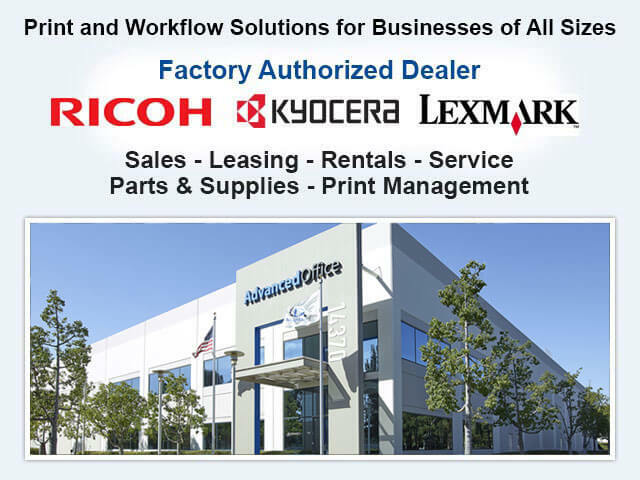 Advanced Office offers businesses in Torrance access to Ricoh and Lexmark's exceptional line of copiers, printers, and related digital office equipment. Ricoh accounts for nearly a quarter of all office technology products sold worldwide and is currently the #1 US market share holder. They are a widely recognized industry leader when it comes to quality, having won the prestigious Deming Award two times now. Ricoh's diverse line of products includes copiers, printers, production printers, wide-format printers, digital duplicators and fax machines. These state-of-the-art machines are not only feature rich but also extremely fast and highly durable. Since its founding in 1991, Lexmark has quickly become the go-to company for specialized industry-specific copier and printer solutions. Their award-winning A4 printers and copiers offer unmatched speed for their price and footprint, come with environmentally friendly green modes, and are equipped with comprehensive security features and advanced, intuitive application-based interfaces. With their exceptional line of printers and multifunction devices, Lexmark has become the preferred choice among three-quarters of the world's top retailers, pharmacies, and banks. The professionals at Advanced Office have leased, rented and sold Ricoh and Lexmark printers to businesses in the Torrance area for decades. Our Ricoh and Lexmark printers are available in a wide range of models that include black and white printers, color printers, low-volume desktop printers, high-volume production printers, and everything in between. These printers feature a large variety of features and accessories to meet the needs of every type and size of business. Ricoh and Lexmark printers rank highly for durability, print quality, functionality, reliability, ease of use, ink yield and value. However, the key to getting the very best printer for your Torrance business is having a copier and printer specialist analyze your print and workflow needs and make educated recommendations for the best printers to meet them. Call today for a free workflow analysis and printer estimate in Torrance from Advanced Office. By providing a free personalized workflow analysis, Advanced Office will help your business in Torrance become more productive and cost-efficient. We'll evaluate your business's print production and document management needs and identify the right copier brand and model to meet them. At Advanced Office, we have over three decades of experience in copier sales, leasing, and rentals, and our sales consultants average over 15 years of industry experience. They are specialists in Lexmark and Ricoh copiers (aka multifunction devices and MFPs) and can walk you through their exceptional features. Call today to learn more about our copier leasing, sales and rental options as well as our expert installation, maintenance and repair services. 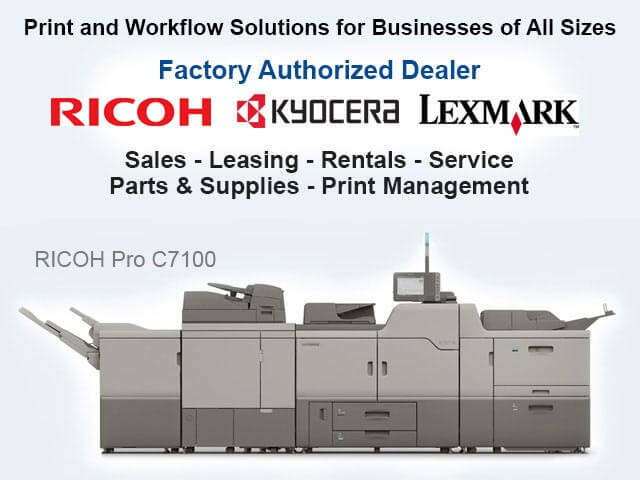 Ricoh's line of production printers feature impressive image quality, fast print speeds, full bleed capabilities, and a large array of accessories and print software options. Among Ricoh's selections of production printers are continuous feed printers, cutsheet printers and wide-format printers. These high-performance commercial printers offer a great alternative to off-set printing. They're all built with high-quality components, which means that they last longer and need to be replaced less often. Each production printer also comes equipped with a fiery, which allows for advanced printer control and produced better quality prints. Plus, they are very cost-efficient. To determine which production printer is right for your Torrance business's in-house print shop or CRGD (central retrographics department), speak with an Advanced Office copier and printer expert today. Our copier and printer leasing and sales consultants average 15 years of industry experience and know how to provide reliable production printer recommendations that meet the high expectations and diverse needs of our Torrance clients. Digital duplicators are often the best copier option for Torrance businesses that routinely produce high volumes of one-page copies, such as flyers, posters, and handouts. 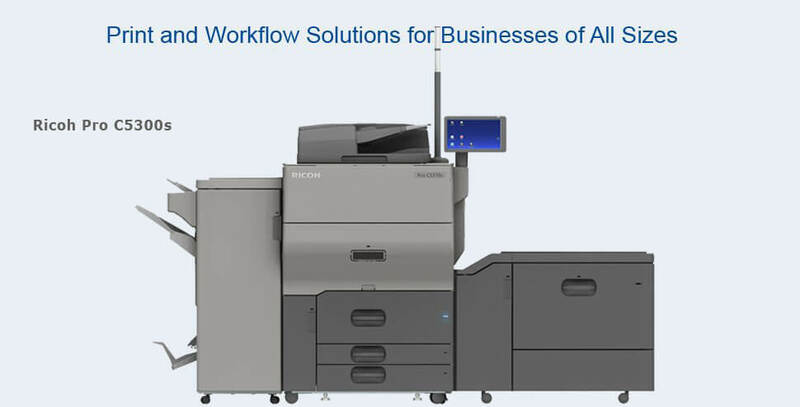 Ricoh's digital duplicators are not just extremely cost efficient--printing copies for just a fraction of the cost of a standard B/W copier--but also easy to use, incredibly fast (with a copy speed of up to 135 ppm), highly durable (up to a 15 million page lifecycle), and environmentally friendly. Call Advanced Office today to obtain free estimates on a competitively priced digital duplicator for your Torrance company, school, church, or non-profit. Advanced Office is Torrance's best choice for fax machine sales, leasing, rentals and service. 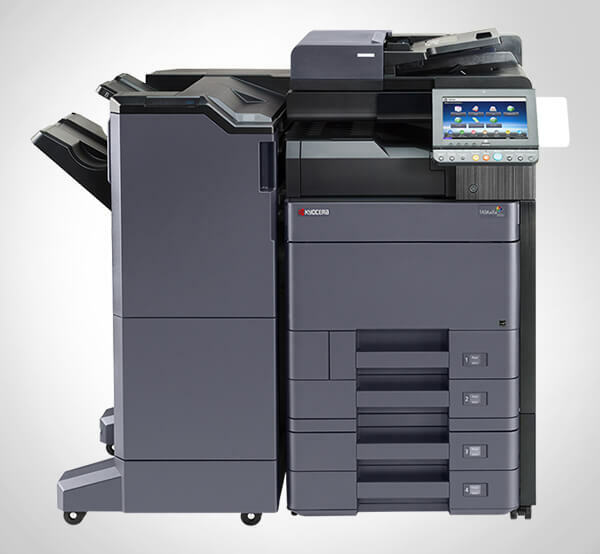 We specialize in supplying Torrance businesses with Ricoh's feature-rich fax machines at very competitive prices. Ricoh (as well as their related brands Lanier, Savin and Gestetner) manufactures a broad range of fax machines, from affordable desktop models to high-capacity models. All of our Ricoh fax machines offer impressive print resolution, fast scanning speeds, and complete copy capabilities, but our high-capacity models go above and beyond when it comes to performance, providing storage for up to 3,000 pages, faxing up to 6,000 pages per month, and transmitting as many as 30 pages a minute. Call today to have an Advanced Office copier and printer expert help you determine which fax machine will best suit your Torrance business's needs. One of the ways we are able to help our clients in Torrance save money and become more productive is by offering them in-house print management solutions tailored to their unique needs. One of the most cost-efficient solutions is our customized workflow and document management software. At Advanced Office, we have a team of in-house IT specialists who are experts in printer and copier software. They can design and integrate security software, billing software, electronic content management software, scanning software, desktop management software, rules-based printing software, and even custom-build software for businesses of all sizes. Call today to start exploring what print/document management software can do for your Torrance business.